At the 144th Ordinary General Assembly, the Board of Directors of the Bremen Cotton Exchange elected Jens D. Lukaczik (52) as its new President. Lukaczik is the Managing Partner of Bremen-based Cargo Control Germany GmbH & Co. KG. 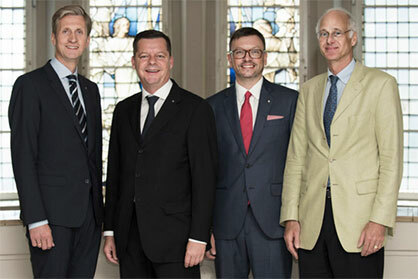 The new Vice Presidents are Ernst Grimmelt (51), Managing Partner of Velener Textil GmbH in Velen, Westphalia, Fritz A. Grobien (60), Managing Partner of Albrecht, Müller-Pearse & Co. Trade (GmbH & Co.) KG, Bremen, and former President Henning Hammer (42), Managing Director of Otto Stadtlander GmbH, Bremen. During the General Assembly, the Board of Directors was also newly elected. New to the Board are Stephanie Silber, Managing Director Otto Stadtlander GmbH, Bremen, Jean-Paul Haessig, RCMA Asia PTE LTD, Singapore and, as a representative of the Swiss textile industry, Peter Spoerry, Spoerry 1866 AG, Flums. Remaining on the Board are Jan Kettelhack, Hch. Kettelhack GmbH + Co. KG, Rheine, Konrad Schröer, Setex-Textil-GmbH, Hamminkeln-Dingden, Axel Trede, Cotton Service International GmbH, Bremen and Hannes Drolle, Getzner Textil AG, Bludenz, Austria. Rainer Hammer, Otto Stadtlander GmbH, Bremen, who has been a member of the Board since 1996, left the Board, as did Martin Kaegi, Hermann Bühler AG, Winterthur, Switzerland. The members of the Board and the Executive Committee represent different areas of the textile supply chain, e.g. trade, processing and logistics. With this diverse expertise, the Bremen Cotton Exchange has access to a comprehensive network and global information resources throughout the cotton industry. At its 144th Annual General Assembly in the 146th fiscal year, the Board of Directors reported to the members on the past financial year and presented its accounts in accordance with the articles of the Association. At the end of the General Assembly, there was a speech by Dr Ludger Weß on “Genetically Modified Cotton: Myths and Reality.” Dr Weß advises innovative companies on strategic communications. He has also worked as a writer and commentator since the 1980’s, especially in the field of genetic engineering and modern agriculture.